"Explained how to buy and store Eggplants was very good." A slightly sweet, tender fruit covered with a shiny skin that ranges in color from dark purple, which is the most familiar, to red, yellow, green, or white, depending on the variety. Eggplants are members of the nightshade family that include the potato and tomato, which makes them technically a fruit but they are generally thought of and prepared as a vegetable. The shape of the different varieties can range from a pear or a globe shape to a long, slender tubular shape. An eggplant may also be referred to as aubergine (French), berenjena, brinjal, Guinea squash, garden egg (bitter ball), melongene, melanzane, or zapallito (Spanish). The American varieties are most often dark purple in color, pear-shaped, and larger in size, averaging 3/4 to 1 1/4 pounds. These are the Black Bell and the Purple Globe variety. The eggplant's flesh is white and contains a number of seeds. The flesh generally has a fairly bland flavor but because of its sponge like texture, it takes on the flavor of other foods, spices and seasonings it is cooked with. Eggplant is low in calories and fat but high in fiber. It is a source of potassium, iron and protein. The raw flesh contains some levels of toxic solanine, so it should be cooked before it is eaten. Cooking the eggplant gets rid of the toxic solanine. There are many varieties of eggplant available and they are very popular in Asian, Middle Eastern, and Mediterranean cooking and growing in popularity in the US. Eggplant is excellent when stuffed with a variety of ingredients or cooked using one of several methods, such as sautéing, frying, broiling, baking, grilling, or slowly cooking in meat, rice, or cheese dishes and stews. When prepared on their own they are sometimes breaded or battered before cooking. They are also used as appetizers or can also be substituted for pasta in lasagna dishes. One very popular dish is Eggplant Parmigiana. Most of the different varieties of eggplant are interchangeable in recipes. The American eggplant, also referred to as the Western eggplant, is available all year round but it will be found most readily available in local markets in the late summer to early fall, with August and September being their peak season. The other varieties are harder to find and may not be available all year round. Check large supermarkets, specialty markets and local farmers' markets for availability. When selecting an eggplant, look for one that has a shiny, smooth skin that does not have bruises or blemishes. It should feel heavy for its size and when tapped on it should sound solid and not hollow. The smaller eggplants are generally sweeter, thinner skinned, more tender, and have fewer seeds. Another method of choosing an eggplant is to check as to whether it is a male or female. The male generally has fewer seeds, making it less bitter. The male eggplant is rounder and smoother on the bottom (blossom end) where the female has an indentation similar to a dash on its bottom. To check ripeness of the eggplant press the side with a finger or thumb, if it doesn't make an indent with little effort, it is not ripe. If pressing the side makes an indentation but does not spring back in a couple of seconds, it is overripe. If the indentation springs back in 1 or 2 seconds it is ripe. If overripe the eggplant will be bitter. Check the stem for freshness, it should be bright green and look moist, as if it had been recently cut. Eggplants do not store for a long period of time. It is best to use them within a day or two of purchasing or picking from the garden. They can be stored in a cool, dry place for 1 or 2 days but to store longer, they should be refrigerated. To refrigerate, wrap in a paper towel and place in a perforated bag. Store in the vegetable drawer for 4 or 5 day, depending on how fresh it is. They are sensitive to the ethylene gas given off by some fruits and vegetables, such as apples and potatoes, so do not store them with each other. Be careful when handling because they bruise easily. 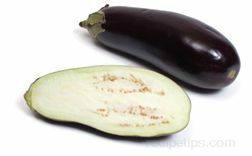 The African eggplant is similar to the Thai eggplant in size and shape. Small in size, the eggplant may be smooth and round or evenly shaped with indented and rounded sections, similar to miniature pumpkins. This variety of eggplant is generally bitter, and is often served in soups and stews, complimenting the flavors of other ingredients. The African eggplant may also be known as Garden Eggs, Mock Tomato, ngogwe, or nyanya chungu. The American varieties, which are the most familiar in the US, are most often dark purple in color, larger in size, and pear-shaped. This variety grows up to 12 inches in length, the average width ranges from 2 to 5 inches in diameter, and they can weigh over a pound. A variety of the Asian eggplant characterized by their long, thin shape and purple coloring. Two varieties of Chinese eggplant are Oriental Charm and Pingtung Long. Chinese eggplants have the most delicate flavor of all varieties, providing a deliciously sweet meaty flesh that is seedless, surrounded by a tender skin, which makes them highly desirable for numerous stir-fry and sauté recipes. They are similar to a Japanese eggplant except that they are a bit longer and are lighter in color. Chinese range in color from white to lavender, while Japanese eggplants are purple to purple-black in color. In recipes, either variety can be substituted for the other. Indian Eggplant A variety of eggplant characterized by its large oval shape and brighter purple coloring. The Chu-Chu hybrid is the most desirable variety for gardens and eating. They are similar in flavor to the Asian or American eggplants and can be substituted if necessary for the other varieties. Italian eggplant, referred to as "melanzane" are similar in shape to the American varieties, but smaller and thinner in size. In addition, they also have a somewhat sweeter more delicate flavor. One of the main varieties is the pear-shaped, dark purplish-black eggplant commonly referred to as the "Italian Purple" eggplant, which is very similar to the American eggplant. The Bianca Oval (a white oval shaped fruit), and the Italian heirloom known as the Rosa Bianca are two more varieties of Italian eggplants. The most common purple Italian eggplant, also referred to simply as "Italian" eggplant, has the pear shape with a dark purple skin covering a white meaty inner flesh. The meat of the eggplants is creamy textured and provides a mildly sweet flavor when cooked. A variety of the Asian eggplant characterized by their long, thin shape and light purple coloring, which becomes dark purple as it matures. They have a deliciously sweet meaty flesh, tender skin, and are seedless, which makes them highly desirable for numerous recipes. They are similar to a Chinese eggplant except they are not quite as long or as light colored. They become increasingly bitter as they age. The Italian heirloom eggplant known as the Rosa Bianca. The Rosa Bianca is round to oval in shape with a thin white outer skin that has a light pinkish purple shading. The meat is creamy textured and provides a mildly sweet flavor with no bitter taste. A variety of Asian eggplants that range in shape from long and thin to round and stocky. The Thai eggplant may be white, green, or purple in color. They have a deliciously sweet and slightly bitter meaty flesh, tender skin, and may be seedless, which makes seedless varieties highly desirable for numerous recipes. Thai Kermit Eggplant: A small round eggplant also referred to as Garden Egg and Bitter Ball, names often associated with a similar eggplant from Africa. It has a green and white variegated skin and the young fruit have a great flavor that is good when eaten fresh or cooked. 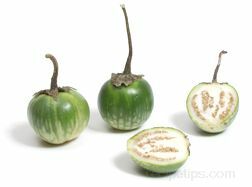 Thai Green Eggplant: A very common Asian eggplant, which is long and thin, typically bright green in color, and grows up to 12 inches in length. It has a thin skin that does not need to be peeled before eating and a mild flavored flesh. The White eggplant, which can be egg or pear-shaped and has an outer skin that is thicker and tougher than the purple eggplant variety. They also have a firmer, creamier texture that is more delicate in flavor. Its color ranges from light ivory to goldish yellow when mature. They should be harvested for consumption before they turn goldish yellow. It is grown in the U.S. as well as many Asian countries.